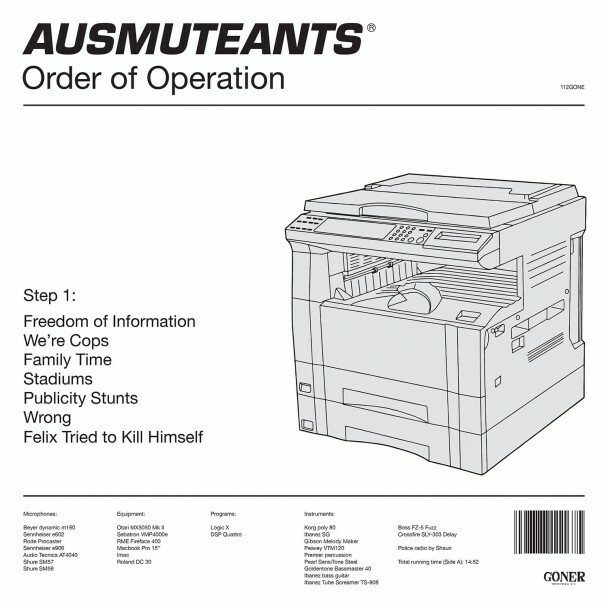 Whip your hair around to this: Ausmuteants have offered us a new taste of their forthcoming third LP, Order Of Operation, with single, ‘Boiling Point’. Recorded and mixed by Mr. Midas Touch himself, Mikey Young, Order Of Operation is purportedly way better than previous LP, Amusements, which was a great record no matter which way you cut it. I’ve got some major salivations stirring for more new material, and ‘Boiling Point’ manages to scratch the itch for now. If you’ve listened to Ausmuteants before, you would be correct in guessing that this song goes hard. It’s roughly two minutes in length but manages cram about 3 songs worth of controlled chaos into one. The song moves in one frenetic heave, it can’t stand still – the keyboard/synth is as active as the guitars and it is one of the unique aspects of Ausmuteant’s sound that has carried on to this new material. The shrill vocals are as piercing as ever and blend in well with the flurry of instrumental activity. ‘Boiling Point’ comes a few months after previous cut, ‘Freedom of Information’ which is a darker, synth-heavy tune but it’s still a rollicking slapper of a song. The group are gaining massive traction in the lead up to Order Of Operation’s release thanks to the announcement of an extensive US tour and a distribution deal with Goner Records (Aarght Records are still releasing the album in Australia). These two songs are brilliant and creative. Ausmuteants have grown up a little bit, and it shows – but these songs still carry enough youthful energy to lighten any old-fart mood you’ve got.